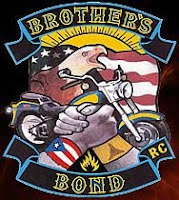 Brothers Bond RC started in 2005 with four guys who met each other in the Army while serving in Germany. The celebrates the passion for riding and the passion for their families. "This club was formed as a non-profit, charitable organization and is open to all bikers, regardless of race, color, gender, faith, or bike model. This club is for any biker who puts family first. We respect all other clubs as we respect our own. We ride the roads in peace and aspire to to bring communities together through social events and motorcycle riding."